If you have been reading discussions at Forum Nokia Developer Discussion Board recently, you may notice there are many questions about signing in S60 3rd Edition. 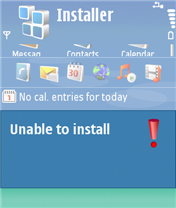 It seems the new security feature in Symbian 9 has led to frustration for some developers. I would like to share what kind of error messages I have seen when installing signed/unsigned application in S60 3rd Edition phones. There is a hint that explains what may cause a particular message. I may not be able to cover all error messages because I may not have seen all of them. Message: Certificate error. Contact the application supplier. Hint: You may have tried installing unsigned application. Note that signing is mandatory S60 3rd Edition. 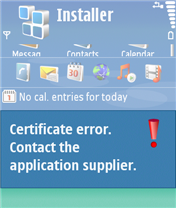 You can use self-signed certificate or developer certificate from Symbian Signed to sign your application. Message: Unable to install. 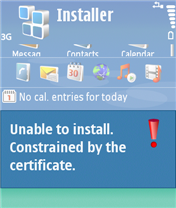 Constrained by the certificate. 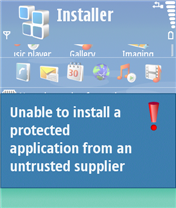 Hint: This message pops up when you attempt to install developer certificate in the unsupported device. The developer certificate from Symbian Signed can only be used in a limited number of devices. Remember that you have to send your IMEIs to Symbian Signed when requesting certificate. You cannot use the certificate in other devices that is not in your IMEIs list. Hint: Check that your certificate can be used to sign all capabilities needed by your application. For example, if you use self-signed certificate, you can only sign basic set capabilities, i.e. NetworkServices, ReadUserData, WriteUserData, LocalServices and UserEnvironment. If your application requires one of the extended capabilities, for example SwEvent, you cannot sign it with self-signed certificate. In this case, apply for developer certificates from Symbian Signed. Hint: If you use self-signed certificate, make sure that your application uses unprotected UID, i.e. 0xA0000000 - 0xAFFFFFFF. If you use protected UID (0x20000000 - 0x2FFFFFFF) or legacy UID (0x10000000 - 0x1FFFFFFF), you will get this message. Hint: This message may come up when your installation file (.sis/.sisx) copies files to other application's private folder, i.e. privateuid. 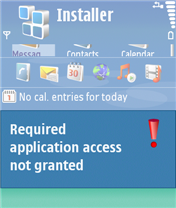 Note that Symbian 9 introduces data caging concept, it means you don't have access to other application's private folder.